In honor of Disney's Beauty and the Beast live action movie that came out yesterday, here are my favorite characters from the 1991 animated classic it's based on. 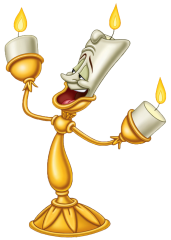 Lumiere has the warmth and personality to light up the Beast's gloomy castle. One of my favorite scenes with him is when he sings Be Our Guest, accompanied by the other servants. It showcases his welcoming and jovial nature and his tendency to tease Cogsworth. I'm excited to see Ewan McGregor play this part in the live action film. 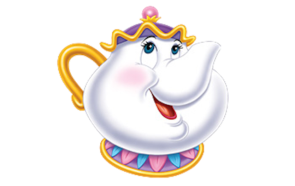 When things go wrong in the castle, which they often do, Mrs. Potts is there to cheer and comfort. She has wisdom about love in a way the other characters don't, and yet she doesn't back down when resistance is needed against attackers. A sincere and strong character, this role seems like a fitting one for Emma Thompson. 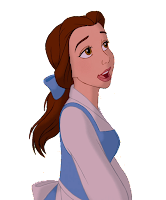 when she takes her father's place as the Beast's prisoner. I loved Emma Watson as Hermione Granger in the Harry Potter films, and I can't wait to see her portrayal of Belle. Of course, I also like the Beast because he learns to love. Which are your favorite characters? Has anyone seen the new film yet? Aw, Maurice is a good one. :) Thanks, Laurie!